Sonigara Homes and ABSOLUTE-LDF, trusted names in the business, have made your wish come true. With a track record of executing over 4500 living and work spaces, and ten more projects under construction at various locations (Pune, Mumbai, Gurgaon and Kerala) this Group has established credibility. 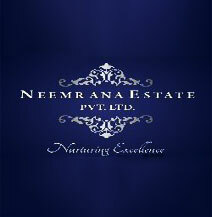 Neemrana County, Ghiloth, cradled in the lap of nature, a luxurious hideout, away from the cacophony of a saturated city is well-planned and built to conserve the rich heritage of the region. A House Becomes a Home When Dream meets Reality Where People Reside Safe, Warm and Comfortable Inside Space for everyone.